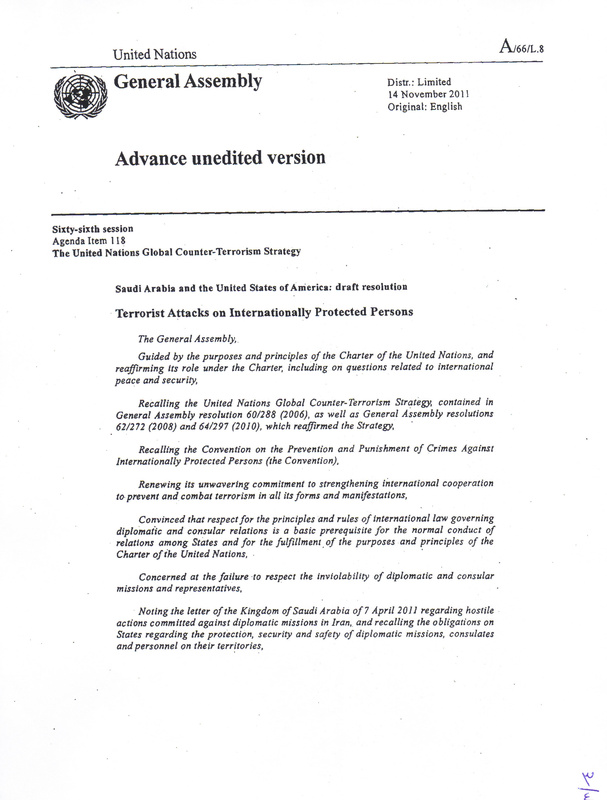 UNITED NATIONS, November 17 -- An advance unedited version of a Saudi and US General Assembly resolution to condemn a plot to assassinate Saudi Arabia's ambassador to the US and to call on Iran to "comply with all of its obligations" was coursing around the UN on November 17; Inner City Press is putting it online, here (Page 1) and here (Page 2 of 2). The idea is to vote on it in the General Assembly as early as November 18. For Palestine another date is named: November 29, the day of solidarity. 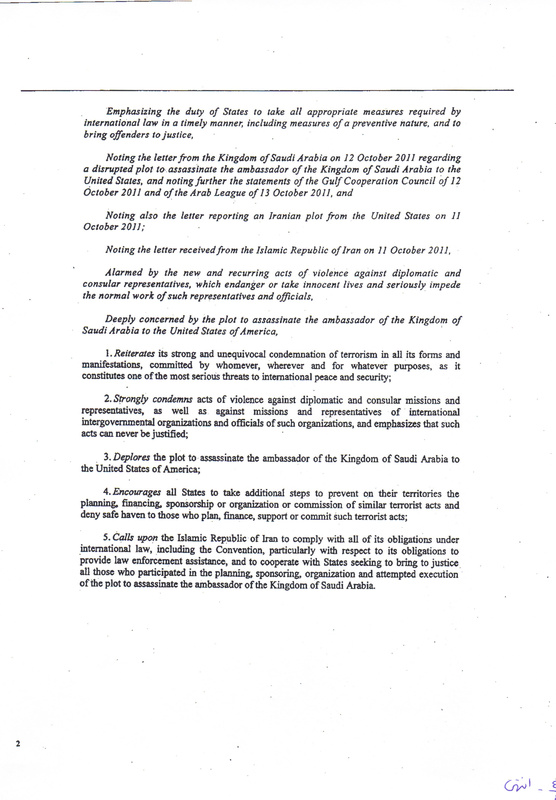 Whether it could be the hook for a fated vote in the Security Council for UN membership, or in the General Assembly for "enhanced non-member Observer state status" is not known. Meanwhile in the GA's Third Committee on November 17 despite media interest in a Syria resolution, the afternoon saw ritualized fights about Russia's anti-Nazi resolution, Cuba's anti-mercenary resolution and a duel between Argentina and the UK about the Malvinas or Falkland Islands. The US spoke against Russia's resolution, saying it violated free speech. On mercenaries, the US opposed dealing with private military companies in the Third Committee. For free speech, it had 21 fellow "no" votes, and 31 abstentions; for PMCs it had more: 51, but only five abstainers. Before the First Committee ended, the ritual fight about North Korea's name -- technically, the Democratic People's Republic of Korea -- gained a new participant. DPRK objected when it was called North Korea, but that in its speech referred to "South Korea." Germany objected, saying that the country, the native land of Secretary General Ban Ki-moon, should be called the Republic of Korea. And so it goes at the UN.